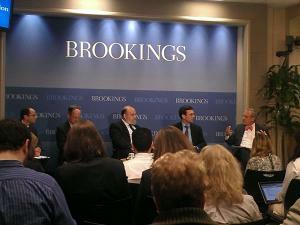 I attended a forum on marijuana legalization  at The Brookings Institution Monday, where Rep. Earl Blumenauer (D-OR), one of a handful of Congressional champions  of marijuana law reform, was one of the speakers. Along with his general optimism for where the issue is going, Blumenauer predicted that the current Congress -- #113, in office this year and next -- will legalize hemp growing. That may be a less bold prediction than in the past -- with the highest-ranking Republican senator supporting hemp now, Mitch McConnell , it should be more likely -- but it's still a fairly bold prediction, when one thinks about just how long Congress has refused to do anything for this utterly no-brainer of an issue. One of Blumenauer's reasons was that a House bill to legalize hemp growing, H.R. 525 , also is being sponsored by a Kentucky Republican, Thomas Massie.